Sammy was a memorable individual. His all to brief life ended in 1983 but not before he had made a lasting impression on many within athletics. Sammy once travelled with a bunch of his Sefton Harrier friends to Bristol for a road relay. On arrival it was discovered that Sefton were a man short, being some distance from home and as it was not going to affect the prizes Sammy was roped in to run as a ringer for the day. Sammy was spotted by a Liverpool Harrier who just happened to be at college in Bristol at that time. He was duly reported and had to stand on the carpet in front of Charles Rice who just happened to be another Liverpool Harrier and secretary of the Northern Counties (almost the almighty of athletics at the time) The outcome was that Sammy got a three month ban!! ” Every club, athletic or otherwise, has it’s own characters who contribute to making ie special. When I reflect on the golden years of my athletic youth spent with Pembroke, it is the characters like Sammy who spring to mind. Sammy certainly made an impression on me when I met him; he was one of the sundry that Ossie Hey introduced me to on that first wonderful evening in September 1952 when I joined the Pembroke club. Harry Sholicar by name, engaged me my attention with their rapid and witty banter. They left me breathless in verbal competition that evening, a condition often repeated when we raced. Sammy was a Pembroke man, one of the everlasting thread of club men who sustain the harrier tradition of British cross country and road running. He rarely raced on the track, a disposition most of us shared with him. But rarely did he miss a road or cross country effort, race or training stint. as may be, able always to enliven tired comrades with a throw away gag or encouraging line. Sammy taught me what club loyalty was. 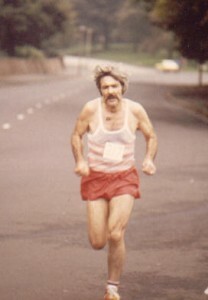 He won his fair share of honours, especially when he moved to the marathon and ultra distance events. In a quite fashion he fitted himself to run a creditable London to Brighton race, to place in his Lancashire Counties 20 mile championship and to represent the County in the Inter Counties race at that distance. For me in Bold Street, by the bombed out Church. Be pinned and chalked, and patted into shape. In collar, cuff, lapel, revers or waist. In the change room an hour before the start. I forget, there is no fitness for death. No freezing balls suspend in wet jock. He’d chuck the chance of paradise for good. With your discoloured underpants and vest. To Ron, his hero more than twenty years. Each changing room bears witness to his life. Forcing the pace with the great one liner. About 200 former athletes gathered for Sammy’s funeral at the gates of Ford Cemetery, Bootle. This must have been a family request as Sammy had been living in Newton-le-Willows. In due course the cortege arrived, the chat ceased and the mourners fell in behind the last vehicle. At the Chapel though everything ground to a halt. The building wasn’t even open! Confusion was rife as employees of the funeral company scattered to look for the grave and the missing priest. In due course the priest was to arrive (Irish of course) muttering something that sounded faintly blasphemous under his breath. For some reason the cortege had begun to solemnly circle the chapel awaiting his appearance. Meanwhile the mourners stood still, all clearly embarrassed. As the vehicles entered the third `lap’ a voice at the back (could it have been Sammy himself?) quietly said, ‘Don’t worry, Sammy, they are taking late entries today’. Sammy would have liked that.